Char Davies (1998). 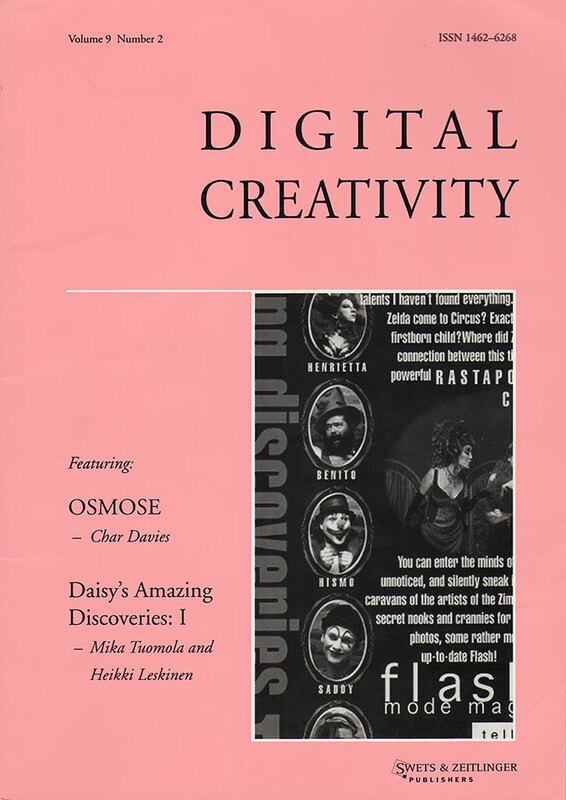 Osmose: Notes on Being in Immersive Virtual Space (1995). Colin Beardon, Lone Malmborg and Masoud Yazdani, eds. Lisse, The Netherlands: Swets & Zeitlinger (1998), pp. 65-74, illus. [Preliminary version published in ISEA '95 Conference Proceedings. This paper discusses the original artistic intentions behind the immersive virtual environment Osmose (1995). The strategies employed to manifest them include the use of an embodying user interface of breath and balance and a visual aesthetic based on transparency and spatial ambiguity. The paper examines the medium of immersive virtual space as a spatio-temporal arena in which mental constructs of the world can be given three-dimensional form and be kinaesthetically explored through full-body immersion and interaction. Throughout, comparisons are made between Osmose and conventional design approaches to virtual reality. The tendency of such approaches to reinforce the West's historic devaluation of nature and the body is also discussed. It is suggested that this medium can potentially be used to counteract such tendencies. In the case of Osmose, an experiential context is constructed in which culturally learned perceptual/conceptual boundaries are osmotically dissolved, causing conventional assumptions about interior, exterior mind, body and nature to be questioned by the immersed participant. By changing space, by leaving the space of one's visual sensibilities, one enters into communication with a space that is psychically innovating. … For we do not change place, we change our nature. These notes were developed during the process of conceptualising and realizing the immersive virtual environment, Osmose (1994-1995). As theory and practice, Osmose addresses a number of aspects related to the medium of "virtual reality" that are often overlooked: these involve the very essence of the medium, in terms of immersive spatiality and the role of the physical body within its domain. In Osmose, I set out to create a work which not only communicates my own particular vision of the world, but which demonstrates the medium's potential to enable us to experience our place in the world afresh, or to paraphrase Bachelard, to change space in order to change our Nature. Osmose is an immersive virtual environment, utilising stereoscopic 3D computer graphics and spatialised sound through real-time interaction. The central experience is that of the immersant, enabled through the wearing of a stereoscopic head-mounted display and a motion capture vest with breathing and balance sensor. During public exhibitions, this rather intimate experience takes place in the company of an attendant in a small private chamber facing onto a larger audience space of relative darkness with two luminous screens. This public space is filled with sound, as it is generated in real-time by the immersant's behaviour in the virtual space. One of the screens is a stereoscopic video projection of the three-dimensional world as it is experienced by the immersant, enabling museum visitors to vicariously witness each immersive journey as it takes place in real-time. The other screen bears the projected shadow of the immersant body silhouette as he/she moves and gestures in response to the work. The use of this shadow-silhouette alongside the real-time video projection serves to poeticise the relationship between the immersant's body and the work, drawing attention to the body's role as ground and medium for the experience. The desire to express a particular content or vision preceded all else in Osmose. The themes in Osmose, i.e., archetypal aspects of Nature, and the desire to dissolve boundaries between interior and exterior within the context of enveloping luminous space, have been the focus of my artistic practice—through the media of painting and 3D software—for more than fifteen years. My background as a painter, i.e., thinking in terms of simultaneous relationships rather than linear narrative, of ambiguous figure/ground gestalts rather than literal illustration, has profoundly influenced Osmose's visual aesthetic. Although I began in the mid-seventies as a representational painter and mastered the conventions of photo-realism (inspired to some extent by Aldous Huxley's call in The Doors of Perception to recognise the "dharma-body in the hedge at the bottom of the garden"), subsequent exploration into my own extreme myopic (near-sighted) vision led me to abandon the photo-realist world of hard edges and solid surfaces for a world of enveloping space filled with ambiguous volumes of luminosity. This "loosening" of a habitual reliance on external appearances eventually led to Osmose. While painting, however, the two dimensionality of the painterly picture plane became an insurmountable limitation to representing enveloping space and, by the mid-80s, I abandoned the medium of painting for that of 3D computer graphics—because this new medium offered the potential of creating in a virtual three-dimensional space on the other side of the picture plane. In 1988, I became a founding director of the software company SoftImage and began to work with the company's technology for my own artistic purposes. Between 1990 and 1993, I produced a series of 3D computer graphic images titled The Interior Body series, all of which dealt with metaphorical themes which recur in Osmose. However, although these images were created in virtual 3D working space, they were output through photographic media as two-dimensional stills, thus defeating my original intent. And so, seeking a more effective means with which to communicate a sense of enveloping spatiality I began to work with VR, or what I prefer to call "immersive virtual space". A simplified schematic of Osmose. Simply stated, Osmose is about being-in-the-world in its most profound sense, i.e., our subjective experience as sentient, embodied, incarnate, living beings embedded in enveloping flowing space. Osmosis: a biological process involving passage from one side of a membrane to another. Osmosis as metaphor: transcendence of difference through mutual absorption, dissolution of boundaries between inner and outer, intermingling of self and world. Osmose as an artwork is motivated by the desire to heal the Cartesian split between mind/body, subject/object, which has shaped our cultural values and contributed to the West's dominating stance towards (and estrangement from) life. In this context, Osmose seeks to re-sensitise—reconnecting mind, body and world. There are a dozen virtual world-spaces within Osmose. Most of these, with the exception of an introductory Cartesian Grid, are based on archetypal elements of Nature: they include a Forest, Leaf, Clearing, Pond, Abyss, Subterranean Earth and Cloud. Two other worlds, Code (containing lines of custom software used to create the work) and Text (my own writings and excerpts of relevant philosophical and poetic texts on Nature and technology), function as a conceptual substratum and superstratum parenthesising the work. All of these worlds connect to one another in various ways. There is also a Lifeworld, symbolising Life/Earth/Nature itself, which appears when it is time to bring the immersive session to a close. The visual aesthetic of Osmose relies on transparency and ambiguity. I have developed this aesthetic over many years of my own art practice, first through painting and then through making 3D computer graphic still images. Most of the various world-spaces of Osmose are represented poetically, in terms of their implicit, interior qualities rather than phenomenal outward appearances. Representation hovers midway between figuration and abstraction and figure/ground relationships are ambiguous to allow for open-ended emotionally-associative interpretations, rather than superficial illustration. Temporal transitions between world-spaces are slow and subtle, creating fluid, spatially complex, non-Cartesian relationships between worlds and, under certain circumstances, allowing multiple world-spaces to be experienced simultaneously. These various elements work together to loosen the mind's rational hold, dissolving the subject/object dichotomy and, in a dream-like way, shifting the immersant's mode of experience away from the everyday bias of eyesight to one that resonates deeper within the physical body. The sound in Osmose is spatialised and interactive in real-time, responding to changes in the immersant's location, direction and speed. My goal was to have sound that was neither literal nor illustrational, musical nor sound effect-like, but which was, in equivalence to the visual aesthetic, aurally ambiguous. I also wanted the sound to be hauntingly emotional rather than abstract or chaotic. The composer and designer thus were faced with the challenge of spatially and temporally shaping a composition that would change in real-time according to the immersant's interaction. All the sounds in Osmose are derived from samplings of a single male and female voice, a compositional decision which subliminally re-affirms the presence of the human body within the work. The significance of sound in the design and experience of virtual spaces is often underestimated: in Osmose, sound and imagery have become one, amplifying each other. The interaction or user interface of Osmose has been designed to be body-centered, based on the intuitive, instinctual, visceral processes of breathing and balance. Through breath, the immersant is able to rise and fall in space with ease and precision. By subtly altering the body's centre of balance, the immersant is able to change direction. The use of these methods has been largely inspired by my own experiences of scuba diving and has many implications for the work as a whole, both on an instrumental level and in terms of metaphor. The methods are intended to reaffirm the role of the living physical body in immersive virtual space as subjective experiential ground. They are also intended to act as channels of communion rather than root of control, encouraging the immersant to effectively "let go". As in meditation, the practice of following one's breath and being centered in balance opens up a profound way of relating to the world. The chiasmatic interrelation between embodied being and world has long been a focus of western philosophical inquiry by Heidegger, Merleau-Ponty and others. The Buddhist and Neo-Confucian traditions of "forming one body with all things", otherwise known as expansive awareness, also explore this interrelationship (Leder 1990, Callicott 1989). Such expansiveness of self towards other must be tempered by discretion however, if aggressive trampling across another's borders is to be avoided. This can best be accomplished through the recognition of "difference" in addition to continuity, i.e., approaching the world with "tact". The implications of this tactful attitude, as well as its more usual absence, have been explored by various feminist and environmental writers, and is alluded to by Heidegger in his notion of "releasement toward" the world (Conley 1993, Scheibler 1993, Plumwood 1993). Digital image captured during a live fly-through of the immersive virtual environment Osmose. The medium of immersive virtual space is not merely a conceptual space but, paradoxically, a physical space in the sense of being extended, three-dimensional and enveloping. As such it is an entirely new kind of space that is without precedent. I think of immersive virtual space as a spatial-temporal arena, wherein mental model or abstract constructs of the world can be given virtual embodiment in three dimensions and then kinaesthetically, synaesthetically explored through full-body immersion and interaction. No other space allows this, no other medium of human expression. At present, bodily access to immersive virtual space is most effectively achieved through use of a stereoscopic head-mounted display. Such an encumbered approach is disparaged by many because of its inconvenience and health risks. However, as a diver who dons a tank of air, mask, fins, weights and buoyancy-control vest to access oceanic space, I consider wearing a head-mount a small inconvenience because it offers access (or at least the illusion of it) to this unique space. As humans, we have bodily access to very few kinds of space: most people are in fact limited to the terrestrial, i.e., life as it is experienced on the surface of the Earth. Others, through recreational diving, have access to what I call oceanic space. Most designers of virtual environments rely on everyday experience of terrestrial space to define the appearance of their virtual worlds and modes of interaction within. As a result, their virtual worlds are filled with hard-edged solid objects, horizontal floors and walls. Similarly, interface/navigational methods are biased towards walking on treadmills and driving with joysticks. Not only do these approaches to immersive virtual space limit its potential to recreating our everyday experience, but they tend to uphold the status quo and the conventions of a Western world view. Osmose, on the other hand, has been influenced by my experience as a diver of deep oceanic space. Oceanic space is not empty but enveloping and sensuous, not horizontal but vertical, often beyond measuring. At depths of 100-200 feet of water over a 6000 foot abyss, the ocean takes on the quality of pure limitless space: fluid, enveloping, interior, embryonic. Distinctions between near/far and inside/out become blurred: a luminous speck can be a distant shark or rod misfiring in the retina of one's own eye. Divers do not walk or drive or fly or manipulate joysticks, but float, free from gravity, using subtleties of breath and balance to ascend and descend. Buoyancy control is an essential skill that enables divers to hover motionlessly in "mid-air" and move subtly and sensitively, literally approaching the world with tact. In this way, diving can become a very calming, centering experience. Two years ago, I was diving above a blue hole in the Bahamas, floating between cold layers of lacy white cobweb-like algae and warm layers of ochre gas-clouds. I lost all sense of where I was, whether I was inside a dream or having a hallucination: there was nothing familiar, the experience was completely outside my earthly references, and filled me with exhilaration and awe. In this way, diving offers a means of changing space, as referred to by Bachelard. There is another physical space which bears relevance to immersive virtual space. This is the subjectively-felt interior space of the self i.e., where our minds and visceral organs project the immaterial imagery of dreams. Joseph Campbell has written that all human imagery arises from a single psycho-physiological source, namely the human imagination grounded in the material body (Campbell 1986). Although our culture has drastically separated exterior from interior, valuing the objective over the subjective, and mind over body, poets such as Rainer Maria Rilke and the philosopher Gaston Bachelard spent much of their lives reaffirming the interrelationship, the interplay, between exterior physical world-space and the interior spiritual space of self. The Buddhist and Neo-Confucian traditions also explore this relationship (Leder 1990, Callicott 1989). Both interior and exterior space merge osmotically through the body. It is impossible to speak of immersive virtual space or of enveloping physical space without speaking of the body, for the very experience of being spatially enveloped depends on having a centre of being. And for us, as incarnate beings, this centre is the body. It is only through the living organic body that we can access the world. And paradoxically, it seems that it is only through the body that we can transcend the body. My concerns with the body in immersive virtual space are not with its objective representation, i.e., how it is perceived by others, but rather how the immersant's mind and body are subjectively felt, how the immersant senses his or her own interior body as a centre-of-being within immersive space. By its very nature, immersive virtual space invites full-body kinaesthetic interaction, leading to deeper engagement than that involving just the mind. I believe that it is only through the body, through body-centred interfaces (rather than devices manipulated at arm's length) that we can truly access this space and explore its potential. Such emphasis on the body's essential role in immersive virtual space may be inherently female. The whole notion of space as enveloping a body at its centre is probably feminine rather than masculine, as may be the desire to use this technology to re-integrate, re-sensitise, and re-affirm life itself. Osmose has been deliberately designed as a solitary immersive experience. Use of a head-mounted display to evoke a sense of full body envelopment, a separate immersion chamber, and the overall hush and darkness of the public area tend to heighten this sense of solitude. My intent was to construct a site whereby participants could enter a state of calm and contemplation rather than hyperactivity, of self-reflection rather than linking up with other people. According to Bachelard, "... through their 'immensity' these two kinds of space—the space of intimacy and world space—blend. When human solitude deepens, then the two immensities touch and become identical." The paradox of immersive virtual space is that the immersant feels embodied and disembodied at the same time. In Osmose this paradox is amplified. After a certain period of immersion (usually about ten minutes), various conditions related to the imagery, luminosity, semi-transparency, spatial ambiguity, slow subtle transitions between worlds, evocative resonant sounds, along with solitude, deep breathing and maintaining one's centre of balance within the space all combine to create a suspended dreamlike state in the immersant's mind, which is experienced as a distinct shift of awareness as he or she lets go of the rational urge to control, and boundaries between inner, outer, mind, body, space and time begin to dissolve. Another key aspect of immersive virtual space is its immateriality, i.e., its capacity for containing three-dimensional representations of ideas or metaphors which cannot exist physically in the real world. This quality differentiates immersive virtual space from two-dimensional media such as painting, photography, film and video and also from three-dimensional media such as sculpture and theatre, in that its virtually embodied forms have no solidity. In Osmose, such immateriality is heightened through the use of transparency and translucency and by enabling immersants to float through things, so that material barriers between self and world disappear. Osmose also attempts to encompass a temporal dimension, by the use of particle flows, streaming through the various world-spaces to represent the flows of rivers, root nutrients, and so on. In addition to the immersant's more obvious experience of real-time interaction and movement within the space, there is a more subtle, visual transformation. This is achieved through the use of multiple semi-transparent objects and textures, which pass by one another, in front or behind, in relation to the immersant's changing point of view as he/she moves through the space. The ensuing perceptual ambiguities allow the experience to become very personal, actively engaging the participatory imagination of the immersant. It is important to address here the relationship in Osmose between Nature and technology. In this context, by Nature I mean that which is born, not-man-made, i.e., the living flowing world around us, not the cement and pavement and plastic and steel that surround us in cities but rather earth and rivers and forests and fields. These elements have a deeply life-affirming power, because they are not-us, and are the source from which we came and to which we will return. As technology, Osmose does not seek to replace Nature. Immersion within Osmose is not a replacement for walking in the woods. Osmose is a filtering of Nature through an artist's vision, using technology to distil or amplify certain interpretive aspects, so that those who enter Osmose can see freshly, can become re-sensitised, and can remember what it's like to feel wonder. In reminding people of the extraordinariness of simply being alive in the world, Osmose acts as a spatial temporal arena where we can perhaps re-learn how to "be". The context in which Osmose is situated is of prime importance. Our culture's privileging of mind over matter has led to devaluation of the body, as well as of women and various "others". Historically this world-view has contributed to the plundering of non-human beings and their habitats as objects for human use: the negative implications of this stance are becoming ever more apparent as evidence of worldwide environmental degadation increases. As "unspoiled" unmediated Nature recedes from our lives through urbanisation of exploding human populations and habitat destruction, there is evidence that while the biological consequences for many species (including ourselves) are devastating, the effects may be psychologically damaging as well. This premise, known as the Biophilia Hypothesis, suggests that the increasing loss of access to Nature—as a source of our human spirituality—may prove to be at the root of our collective psyche's deepest wounds (Wilson 1993). As a culture, we are on the cusp of a new technological paradigm: the emergence of cyberspace. As a means of global communication it will alter our world significantly. We must however be wary: as a realm ruled by mind, cyberspace is the epitome of Cartesian desire, in that it enables us to create worlds where we have total control, where the presence of aging mortal flesh and animal-others is absent, where there is, to paraphrase Laurie Anderson, no "dirt". Popular and media-hyped expectations of "virtual reality" seem to reflect a longing to transcend the limitations of our physical surroundings and, indeed, its long-term effect may be to seduce us to turn away en masse from our bodies and Nature, enchanted and distracted while we continue wasting the resources that sustain us and erasing the futures of countless other-beings on the Earth. Given the cultural context, I believe that this desire to escape the confines of the body is symptomatic of an almost pathological denial of our materiality and mortality. For me, it is even tempting to suggest that belief in artificial intelligence and silicon as a means of delivery into immortal omnipotence on some other Eden is but a testosterone-induced dream. Many forms of digital media offer evidence of dominant Western values. In its most prevalent form, virtual reality can be considered to be "a literal re-enactment of Cartesian ontology" (Coyne 1994, Gigliotti 1993) representing the human subject as an omnipotent and isolated viewpoint, "an island of consciousness in a sea of insensate matter" (Leder 1990) manoeuvring in empty space and probing objects with an acquisitive and most often masculine hand (Tikka 1994). Most 3D graphic techniques are laden with conventions such as Cartesian space which have been inherited from the Western scientific and military paradigm. The conventional 3D computer graphic aesthetic relies on polygonal textured-mapped models—or what I call hard-edged solid objects in empty space—a combination of low-level mimetic realism with emphasis on surface appearance, Cartesian space and Renaissance perspective, all of which reinforce a dualist way of seeing the world in terms of mastery and control (Jones 1989, Wright 1983). Commercial computer games approach interactivity as a means of empowering the human subject through violence and aggression (Cornwall 1993). These conventional approaches to digital media reflect our culture's Cartesian world-view, with its tendency to reduce the world and its myriad of inhabitants to "standing-reserve" for human consumption (Heidegger 1977). Osmose approaches these issues by seeking to use immersive virtual space and the technology associated with it as a means of resisting the trajectory described above, as a way of acting artistically against the biological, ecological, and spiritual impoverishment of our age. Osmose approaches computer technology as an expressive instrument (not value-free but one whose conventions can potentially be subverted) to access another kind of space, a paradoxically virtual/physical space—that, yes, is entirely of human making, but which, because of its various unique properties, has the potential to act as a site, as a place, where artists can project their visions of the world—so that people might experience another kind of "being", relatively unbound by everyday cultural assumptions. Instrumentally, my goal has involved developing the visual, aural and interactive aesthetic capable of creating the context for such experience —and in so doing, demonstrate the potential of immersive virtual space as a medium for paradoxically reminding us of our place in the world. Osmose Credits: John Harrison, custom VR software; Georges Mauro, computer graphics; Dorota Blazsczak, sonic architecture/programming; Rick Bidlack, sound composition/programming. Produced by SoftImage Inc. 1994-1995. Bachelard, G. 1969. The Poetics of Space. Beacon Press. Bishop, P. 1990. The Greening of Psychology: The Vegetable World in Myth, Dream and Healing. Spring Publications. Callicott, J.B. and R.T. Ames (eds.) 1989. Nature in Asian Traditions of Thought. Albany, New York: SUNY Press. Campbell, J. 1986. The Inner Reaches of Outer Space: Metaphor as Myth and as Religion. New York: Harper and Row. Conley, V. 1993. Preface/Eco-subjects. In Conley, V. (ed.) Rethinking Technologies. Minneapolis: University of Minnesota. Cornwall, R. 1993. "From the analytical engine to Lady Ada's art". In Druckrey, T. (ed.) Iterations: The New Image. Boston: MIT Press. Coyne, R. 1994. "Heidegger and Virtual Reality". Leonardo Vol. 27, no. 1. Davies, C. 1998. "Changing Space: VR as an Arena of Being". In Beckman, J. (ed.) The Virtual Dimension: Architecture, Representation and Crash Culture. Boston: Princeton Architectural Press. Also published (as a paper-in-progress) in Ascott, R. (ed.) Consciousness Reframed: Art and Consciousness in the Post-Biological Era. Proceedings of the First International CAiiA Research Conference. Newport: University of Wales College. Davies, C. and J. Harrison 1996. "Osmose: Towards Broadening the Aesthetics of Virtual Reality". ACM Computer Graphics: Virtual Reality, Vol. 30, no. 4. Evernden, N. 1985. The Natural Alien: Humankind and Environment. Toronto: University of Toronto Press. Gaudin, C. 1987. On Poetic Imagination and Reverie: Selections from Gaston Bachelard. Spring Publications. Gigliotti, C. 1993. Aesthetics of a Virtual World: Ethical Issues in Interactive Technological Design. Doctoral dissertation, Ohio State University. Harrison, R.P. 1992. Forests: The Shadow of Civilization. Chicago: University of Chicago. Heidegger, M. 1971. "What Are Poets For?". In Poetry, Language and Thought. New York: Harper and Row. Heidegger, M. 1997. The Question Concerning Technology. New York: Harper and Row. Huxley, A. 1954. The Doors of Perception. New York: Harper and Row. Izutzu, T. 1975. The Interior and the Exterior in Zen Buddhism. Spring Publications. Jones, B. 1989. "Computer Imagery: Imitation and Representation of Realities". SIGGRAPH'89 Art Show Proceedings. ACM SIGGRAPH. Karim, Y. 1996. Letter to the author. Leder, D. 1990. The Absent Body. Chicago: University of Chicago Press. Levin, D.M. 1983. The Body's Recollection of Being: Phenomenological Psychology and the Deconstruction of Nihilism, p. 274. Rilke, R. M. 1992. The Duino Elegies. Norton. Scheibler, I. 1993. "Heidegger and the Rhetoric of Submission: Technology and Passivity". In Conley, V. (ed.) Rethinking Technologies. Minneapolis: University of Minnesota. Tikka, H. 1994. "Vision and Dominance: A Critical Look into Interactive Systems". ISEA'94 Proceedings. Wilson, E.O. and Kellert, S. (eds.) 1993. The Biophilia Hypothesis. Island Press. Wright, R. 1989. "The Image in Art and Computer Art". SIGGRAPH'89 Art Show Proceedings. ACM SIGGRAPH. Char Davies, artist and [recent]† founder of Immersence Inc., founding director and vice-president of SoftImage, head of Visual Research from 1987 to 1997. Author of the immersive virtual environments, Osmose (1995) and Ephémère (June 1998). Engaged in doctoral research at CAiiA, University of Wales College, Newport. Also a commercial grower of apples. Last verified: Sept. 16th, 2008.